When it comes to being a better coach and coaching your team to be better players, there are a lot of different approaches you can take. There are clinics, or in-personal learning. There are online learning opportunities, both formal and informal. There are books and manuals on the subject. There are YouTube videos. And then there are apps. Apps are made up of downloadable programs through which you can access specific content. Apps are great because you can carry them around in your pocket (on your smartphone) or backpack (on a tablet or computer). This means you can take them wherever you go and have them handy when you need them. And while we at Hustle Training have out own app, we are happy to share with you the other ones that we feel meet muster as top basketball training resources. The system works by using a tracker enabled ball, play censors worn by the players, and anchors that are placed in the ceiling or on the rafters (above the court). Those anchors track the ball and each player, allowing advanced statistics and updates to be tracked by the app. The coaches can get live data and analytics, as well as build custom reports in real time. The players can look at their own results and compare those to their teammates. Parents and fans can also track the teams progress. While this system may be more advanced than many youth coaches need, it is still good to know that it exists and has potential for taking training to a whole new level. It is a complete tool that allows a player to become better in every aspect. As a basketball player, the goal is to be better than your competition on and off the court. With the drills available through our coin based model, you are able to take your game to the next level. Money is not needed to unlock videos. We also emphasise strength and conditioning and a nutritional plan to give you the complete tools you need to become a successful basketball player. We strive to give you the best basketball drills and workouts to help you become an elite athlete. A news feed oriented at basketball news that includes game highlights and sports news. Individual profiles for every member. Social communication messaging and group chat features. Sports nutrition tips and recipes. The ability to get feedback on your own videos. This Artificial Intelligence basketball training app that helps improve the players basketball shots raised $4 million in working capital in 2018, as noted by TechSource. The app starts off with an iPhone. 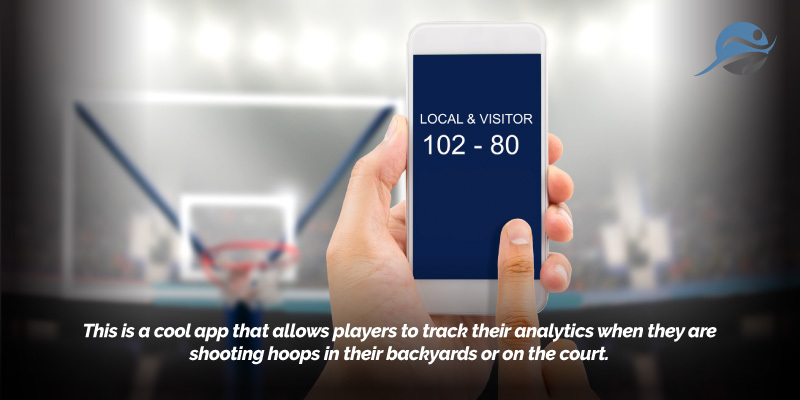 Players can boot up their camera and begin recording their shots, and the app will go back and track what worked and what didn’t work with that shot, as well as where the player is making and missing those shots.It’s not tracking every single motion of the player, but once a player makes a shot, it will track that trajectory and shooting form, like where his or her feet are planted. That kind of feedback can help players understand the kinds of small tweaks they can make to improve their shooting percentage over time, such as release speed or jump height. And while it’s not designed to be hugely robust like the kinds of advanced tracking technology that show up in advanced training facilities at some larger sports franchises, it aims to be a plug-and-play way of getting feedback on a player’s game right away. The app refers to itself as “basketball training revolutionized,” which isn’t far off. And it is likely to become one of the most used training tools for youth, amateur, college, and professional players out there. Are you an athlete? Hustle has tons of workout routines and skill development activities to guide your offseason workouts and in-season tuneups. We give you everything you need to improve your game and reach your full potential. Hundreds of drills covering the skills you need to become a successful coach or athlete. Guided practice plans and exercises designed to help you attain new skills, techniques and know-how. Drill of the Day: daily skills development exercises on a new topic each day. Training led by professional players, coaches and trainers. The companion website for Hustle Training has a series of training plans and articles meant to advance the skills of youth sports coaches, but it is the app that literally has over 1,000 drills to help you train your team.